I just finished my dinner which was a spinach, tomato and cheddar omelet. I don't particularly like cooking - I can cook but I just don't enjoy it - so I generally make simple, quick things and I try to make them have a little pizzazz by adding spices. That's my attempt to lead into my description of this outfit - simple but with a little oomph. Plain black dress with a buckle for interest. 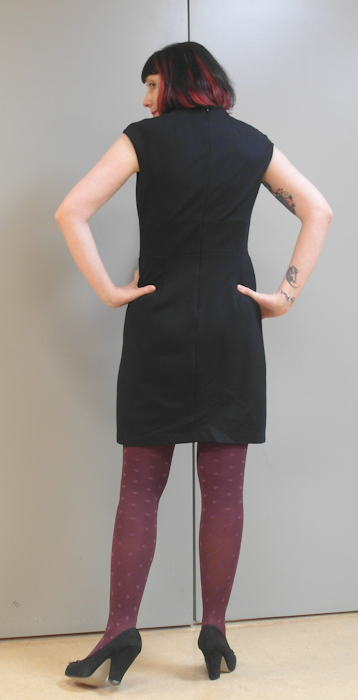 Burgundy tights with subtle polka dots. My "Miss Piggy" shoes with metal on the ties to match the metal on the dress. Simple with some added visual interest. My coworker liked the outfit better with the visible tattoos though. I tend to agree. Don't tell my I don't have this pose down pat. I have no idea how I took the exact same photo here without the cardigan. And now lets turn our back on January and turn the page to a new month. Bring on February. This is a great outfit, simple but with some pizazz. I love the shape of the dress. Your dinner sounds delicious to me. I can cook pretty well, but I figure if I'm going to make the effort and cook I make something as awesome as I can, even with simple ingredients. I love your tatooes shown off too! They're so perfect for your style. Lovely subtle details - and that's the perfect burgundy for your hair! I'm like that with cooking too. Throw all those veggies in a pan and call it stir-fry! Love the simple oufit with the oommph! true the dress looks great with the tattoos.